- The LPDDR2 and DDR2 subsystems aren't shared so in theory for tablets you could do 32-bit SiP LPDDR2+32-bit off-chip DDR2. Seems weird but not impossible. - You can do 32-bit ISM+32-bit PoP. Once again, why do this? Were they limited by package pins with a 0.4mm pitch? Seems unlikely with a 14x14 package but who knows. - You can genuinely do 32-bit PoP+32-bit on the PCB. Still seems really weird to me. The MSM7200(A) had a separate small LPDDR1 chip (16-bit bus with SiP) reserved mostly for the baseband while the primary OS-accessible DRAM was off-chip. This was obviously rather expensive (fwiw Qualcomm only 'won' that generation on software and weak competition IMO) and removed it to reduce cost (making the chip's memory arbitrage more complex) on the MSM7227. I'm not sure about the QSD8650, maybe it still optionally had that extra memory bus (SiP-only) but it was more flexible and never used, it's hard to find that kind of info. I suggest you look into the facts before passing such statements. 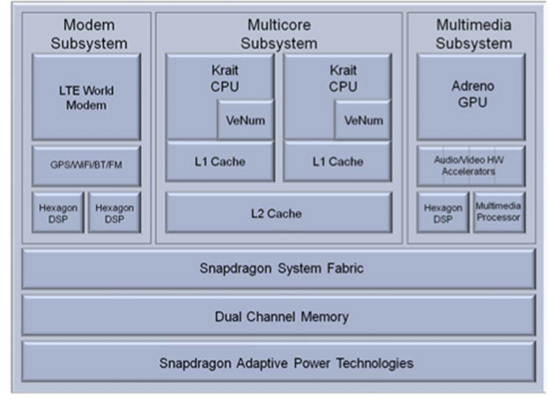 ST-Ericsson has publicly indicated the A9600's A15s can run at up to 2.5GHz, and GlobalFoundries has publicly said that the A9600 uses their 28nm SLP process which uses High-K but not SiGe strain. Is it really hard to believe a 28HPM or 28HP A15 could easily reach 3GHz? I'm not sure anyone will do that in the phone/tablet market, but remember ARM also wants A15 to target slightly larger Windows 8 notebooks and (I'm not as optimistic about this) servers. That is the point I'm trying to make! Semiconductor companies, by virtue of the fact that they have to sign OEM/ODM deals before they really even have working products almost always posture about how much their designs can go 'up to' or 'indicate' ratings and numbers. My beef with the earlier thread was that statements were being passed on as facts based purely on stuff posted in press releases. 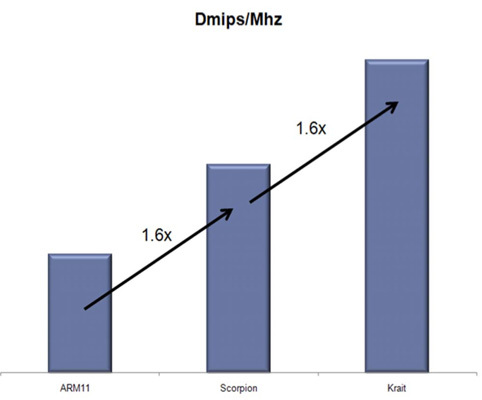 I can tell you, for a fact, that no 2.5GHz Krait (dual or quad) based product will be shipping in '12. I can also tell you for a fact that you will not see anything more than 1.8-2.2GHz (optimistic) in shipping A15's for mobile devices. I understand the A15 architecture is capable of much more, but to try and draw comparisons between a near-shipping mobile-spec quad-core A9 and an on-paper 3GHz A15 powering servers is not correct! ST-E could underdeliver on the A9600, sure, but they've got a better process than OMAP5 and enough clever power saving tricks up their sleeve (some of which still aren't public) that I feel it's quite likely they won't. Remember 2.5GHz is only their peak frequency when a single core is on - they have not disclosed their throttling algorithms (which will certainly be more aggressive for everyone in the 28nm generation, especially on smartphone SKUs as opposed to tablets where higher TDPs are acceptable). Also multiple companies will be making A15s on 28HPM eventually. TSMC has indicated they have a lot of interest in HPM, and that should certainly clock at least 25% higher than GF's Gate-First Non-SiGe 28SLP. However the problem is that the A15 is quite power hungry, so I expect people will use that frequency headroom to undervolt and reduce power although a few might expose it with a TurboBoost-like mechanism. On the other hand, exposing the full 3GHz for Windows 8 on ARM mini-notebooks should be a breeze, and I don't see why you'd expect that to be a problem. As for 2.5GHz Quad-Core Krait in 2012 - I think they're still on schedule for tablets in late 2012, but then again NVIDIA was still on schedule for tablets in August 2011 back in February, so it's impossible to predict these things. Delays happen, and it'd be foolish not to take metafor seriously simply because he is unable to predict the unpredictable.